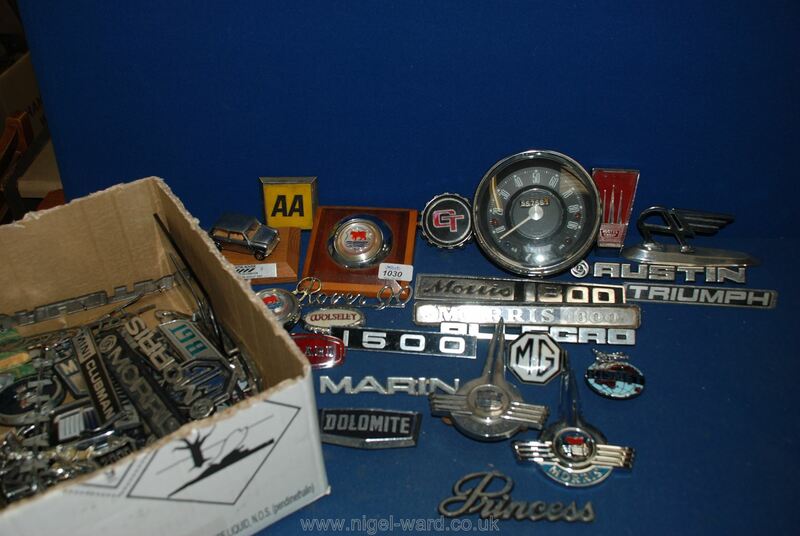 A quantity of British car Badges including Austin Morris Speedometer, etc. Unfortunately, your registration has been declined by the auctioneer. You can contact the auctioneer on +44 (0)1981 240140 for more information. You are the current highest bidder! To be sure to win, log in for the live auction broadcast on 16 Mar 2019 10:00 GMT or increase your max bid. Shipping: We offer our own in-house shipping service at a reasonable cost, the minimum packing charge is £5 for a small item plus whatever charges would apply from a courier, we use Parcel Force, Royal Mail, UPS and FedEx, depending on the destination, we can also arrange a private courier for high value items, please call our salerooms for further information. Please note we DO NOT have the facility to charge your Credit or Debit Card through the-saleroom.com, Payment can only be accepted by Cheque or Electronic Bank Transfer, Please contact our salerooms for further information. Card Payments can ONLY be accepted in person at our Salerooms using "Chip & Pin" and not over the telephone unless you are previously known to us and then to a maximum of £200. Payment can be accepted by Cheque or Electronic Bank Transfer, We DO NOT accept PayPal, Please contact us directly for further details. Shipping: Packing & delivery can be arranged at a reasonable cost. Lots purchased online with the-saleroom.com will attract an additional charge for this service in the sum of 5% of the hammer price plus VAT at the rate imposed. Nigel Ward & Co. Conditions of Sale. a. Each lot as set out in any description or as divided or combined with any other lot or lots is sold by the Vendors with all faults, imperfections and errors of description. b. The Auctioneers do not accept responsibility for the authenticity, attribution, genuineness, origin, authorship, date, age, period condition or quality of any lot. c. All statements, whether printed in the catalogue, published on a website or made orally, as to any of the matters set out in "b" above are statements of opinion only and are not to be taken as being implying any warranties or representations of fact by Nigel Ward & Co.
d. All conditions, notices, descriptions, statements and other matters in the catalogue and elsewhere concerning any lot are subject to any statements modifying or affecting the same made by the Auctioneer from the rostrum prior to any bid being accepted for the lot. 2. The Auctioneer has absolute discretion to divide any lot, to combine any two or more lots or to withdraw any lot or lots from the sale, to refuse, bids, regulate bidding, to cancel the sale without in any case giving any reason and without previous notice. 3. The Auctioneer has the right to bid on behalf of the Vendors for all goods which are offered subject to reserve or at the Auctioneer's discretion. 4. Unless instructions are received previously as to reserve, the Auctioneers, may sell the items without reserve if they think fit. 5. The highest bidder shall be the buyer except in the case of a dispute. If during the auction the Auctioneer considers that a dispute has arisen, he has absolute discretion to settle it or to re-offer the lot. 6. The Auctioneer shall regulate the bidding at his own discretion. 7. Each buyer by making a bid for a lot acknowledges that he/she has satisfied himself/herself fully before bidding by inspection or otherwise as to all the Sale Conditions, the physical condition of and description of the lot including but not restricted to whether the lot is damaged or has been repaired or restored. 8. Each lot shall remain at the Vendor's risk until sold. From the fall of the hammer the lot shall Remain at the Purchaser's risk but in no circumstances must they be removed from the sale until paid for. CHEQUES WILL ONLY BE ACCEPTED FROM PERSONS PREVIOUSLY KNOWN TO THE AUCTIONEER OR OTHERWISE SUPPORTED BY A BANKER'S CARD OR REFERENCE. If payment is made by cheque, the Auctioneers shall have a lien upon the goods, until such a cheque has been cleared by the Bank upon which it is drawn. 9. Legal title will not pass to the purchaser until the lot (s) has been paid for in full and the Auctioneer shall be entitled to a lien on any lot sold until the purchase price is paid in full. Immediately the lot is sold the purchaser shall notify the Auctioneers of his name and address and if called upon to do so by the Auctioneer shall pay such proportion of the purchase price as the Auctioneer may require, in default of which the lot or lots so purchased to be immediately re-offered. 10. Lots shall be paid for in full and taken away from the sale at the buyer's risk and expense immediately on the conclusion of the sale, failing which the Auctioneer shall not be responsible if the same are lost, stolen, damaged or destroyed and any lots not taken away shall be at the sole risk of the buyer and subject to a charge for storage. 11. Unless otherwise stated Buyer’s Premium at the rate of 20% including V.A.T. will be added to the hammer price of all lots purchased. Nigel Ward & Company offer an online bidding service via the-saleroom.com for bidders who cannot attend the sale. • confirm that you are authorised to provide these credit card details to Nigel Ward & Company through www.the-saleroom.com and agree that Nigel Ward & Company are entitled to ship the goods to the card holder name and card holder address provided in fulfilment of the sale. Please note that any lots purchased via the-saleroom.com live auction service will be subject to an additional 5% commission charge + VAT at the rate imposed on the hammer price.